Well, well, well, would you look at this! 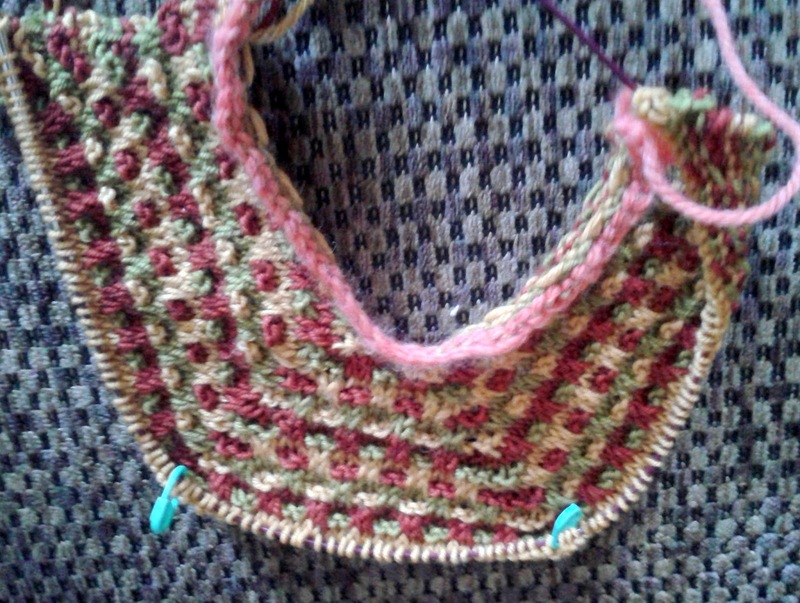 One half of my Serendipity Vest is complete. I think it looks correct. Size is about right, although it hasn't yet been blocked. There are two extensions - both a front and a back, so that is right. One of those extensions is shaped into a 'v' for the 'V' neck. So that is right. will be folded in half and joined together to bring the piece into its final and proper shape. I think I got it! On to the second half. No day late and a dollar short this week. Thursday is happening on Thursday. Back home from her western summer, is Wilma. She has the Painted Desert shawl on her needles. Started before departing for Alberta and B.C. but left at home. She said she was struggling with the pattern and left the shawl at home in favour of easier 'knit & navigate' projects. In this brightly coloured sock yarn, the shawl indeed looks like a painted desert and pattern struggles seem to be behind her now. 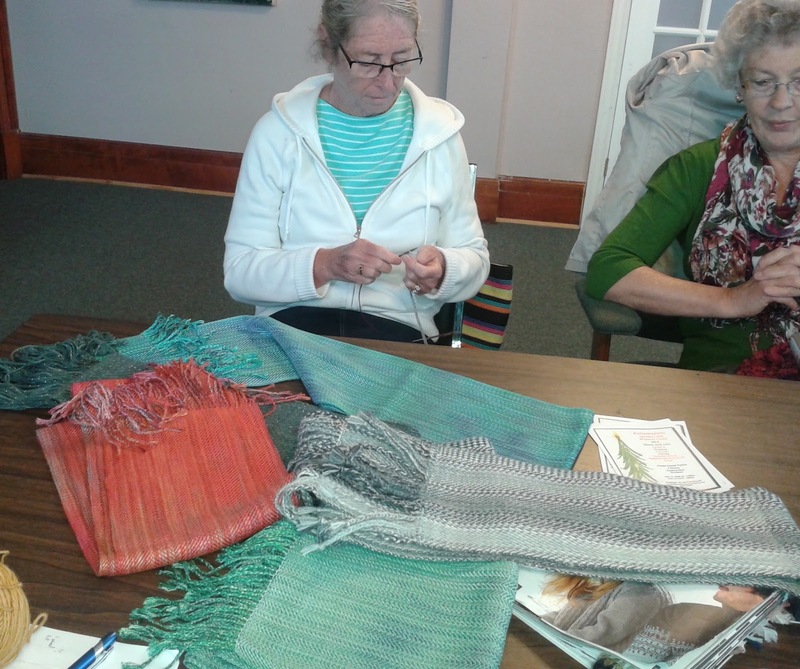 Sharon, last week, told us that she was spending her free time weaving. Getting ready for the November Guild show. Wow, she was busy indeed. These are gorgeous, Sharon. 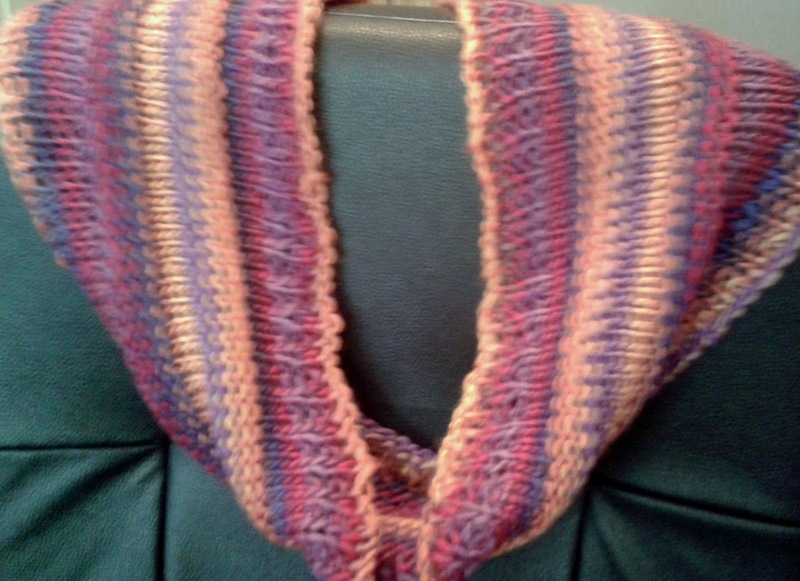 Some woven with hand-dyed Tencel yarn. The Grey one worked with Patons Lace yarn. 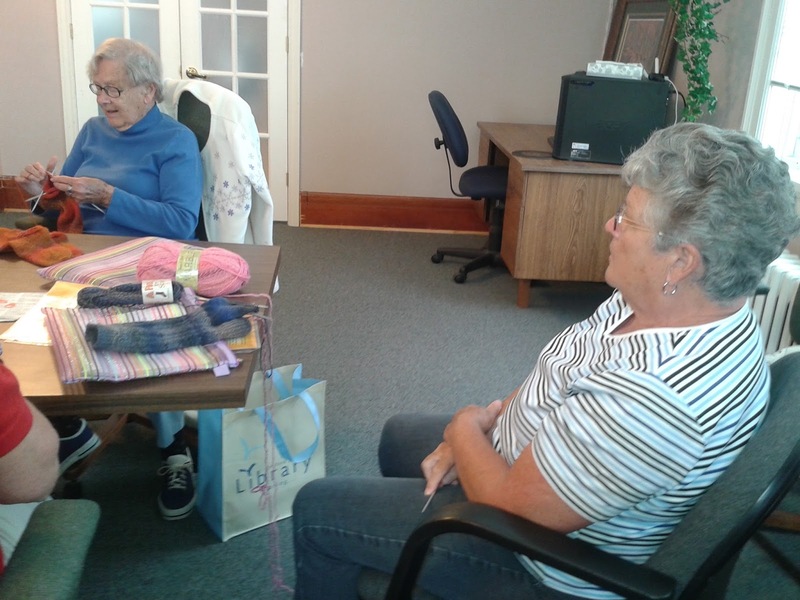 Little Ruth came to knitting today. The first thing she told me was "Brenda, I am a widow, now." Knowing that Ruth was divorced from her first husband and separated from her second husband, I was curious about which of those men had left her a widow. The second husband, she said. The one from whom she was separated. And there was not a bit of sadness in her attitude at all. Grinning from ear to ear, in fact, she was. Ruth makes me smile. No spring chicken, but no moss growing under her feet either. 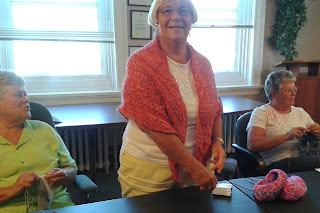 She managed to pick up a bag of Kroy FX sock yarn at Stedman's yarn tent sale in July. 6 balls for $15.00. The socks are cheerful for sure. I love them. 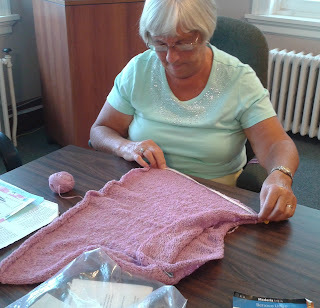 Gail has a sweater started for a grand daughter. 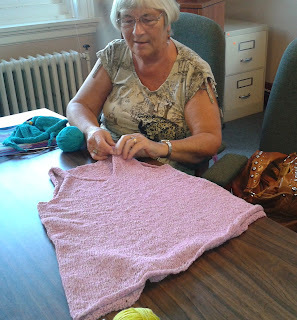 A Knitting a Pure & Simple pattern gail is working with James Brett Marble yarn. Sharon R spent her time picking up stitches along the fronts of her summer 'tee'. Not the first %^$#@* time I've done this she said. But just think, Sharon. It is only new to you once. 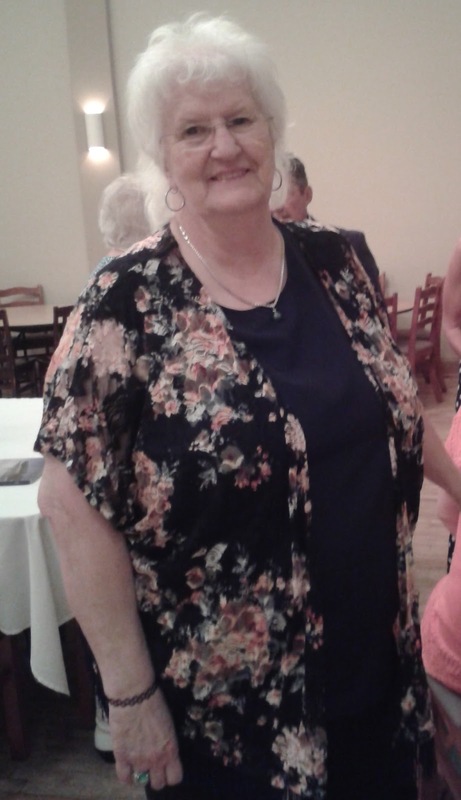 We missed Sandy B today as she is spending the week at her daughter's cottage. With this cool, rainy weather she is enjoying lots of knitting time, I'm sure. I can't wait to see what finished pieces she brings back to show us. Cool weather. Knitters back from vacation. Feels like fall. I'm expecting to see 'wool' any day soon. I think perhaps, I am on the right track with Serenipity. Ready now to start the 'V' neck shaping, the knitting on my needles at least looks more correct. More correct than this one-sided piece did. And more like the schematic shows. Not that I give any credit to the pattern. I've read and re-read it several times and I still believe the pattern says to cast on an extra 38 stitches on one side of the work only. I credit plain, old experience. Sometimes you just gotta' go with your instincts. Well, what happened to Thursday? 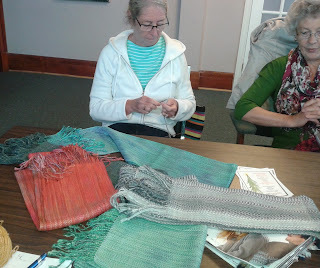 I did go to knit group, and I did take pictures. But as soon as I arrived home last Thursday, Fred and I left for Toronto. His surgery was scheduled for early Friday morning. We either had to drive down Thursday evening or get up at the crack of too early and hope commuter traffic wouldn't make us late. We drove down Thursday. His arteries scrubbed clean, his brain is, once again, on full blood flow and we are now back home. With time to do blog posts. Sandy B started me off on Thursday by modelling her gorgeous blue shawl. Beautiful. I may have mentioned this previously but I think Sandy must have a shawl in every colour under the rainbow. This one is stunning worn over white. 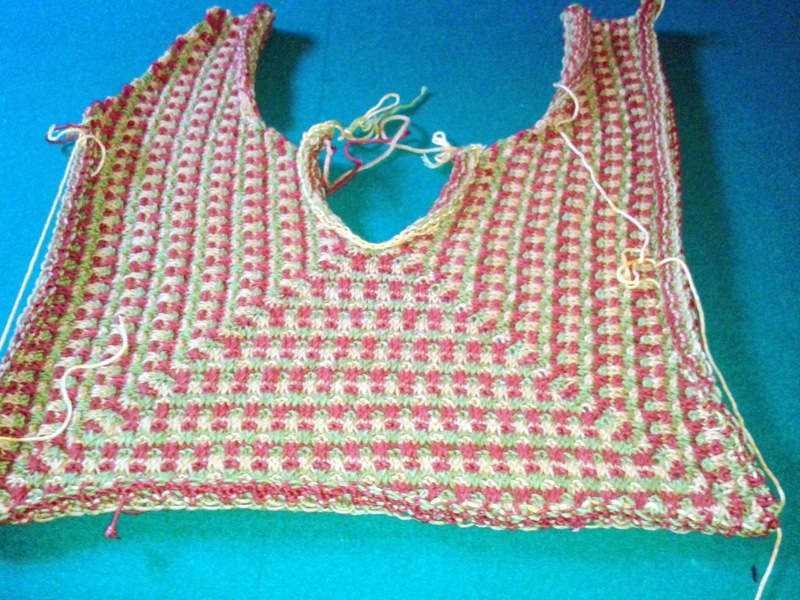 Carol finished the asymmetrical sleeveless top she knit for her daughter. Unblocked here, it is a bit difficult to see the asymmetrical part. But the neckline swings to one side, as does the bottom. I love it. Sharon R, our - learn-a-new-technique-with-each-project - knitter, has both the front and back of her summer tee finished. There is lots of sewing-up to do on this one - sides, sleeves. Next project perhaps she should learn seamless knitting. 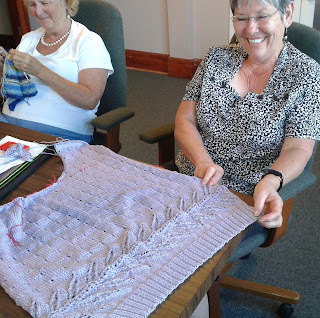 Sandy B has started a lap-ghan. In Florida colours for her Florida living room, in her favourite technique - Mitered Squares. She says there will be several different sized squares in this piece and that she is designing on the go. Yes, that is my Serendipity Vest you see in the background. The jury is still out on its success. 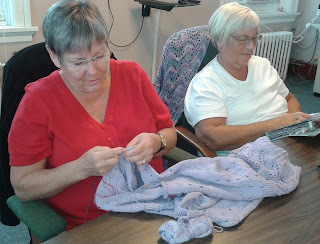 Sharon did tell me what this project is that she has on her needles but I can't remember. 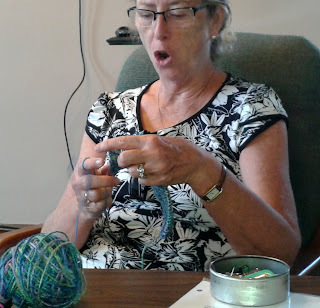 I do recall that she said she grabbed it as she rushed out the door to come to knit group. Her focus lately has been on weaving. Getting saleable items ready for her club's big November sale. Thursday's post will happen on Thursday this week. God willin' and the creek don't rise. 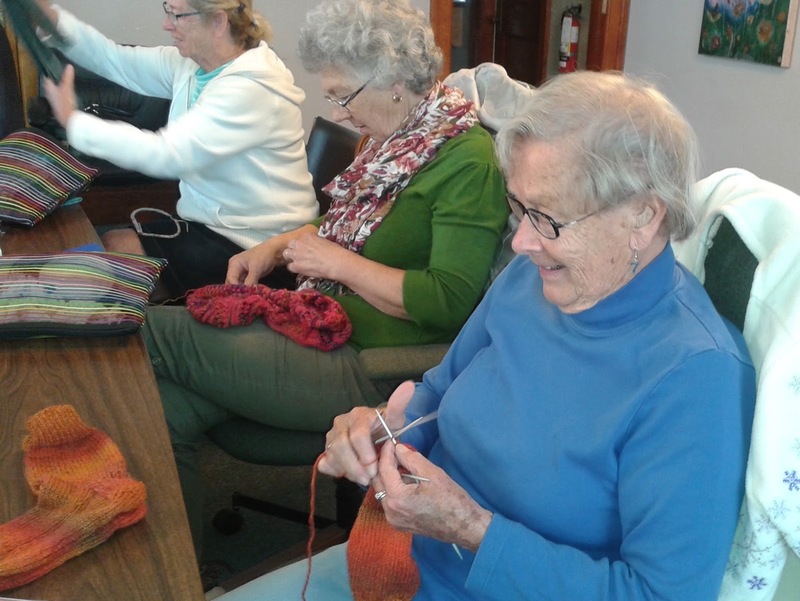 Sometimes, in knitting, there is nothing for it but to carry on. Sometimes, patterns are confusing and complicated but there is nothing for it but to carry on. In the end, it all makes sense. Not so with Serendipity Vest. And to make it worse, I can find no mention of the pattern on Ravelry and therefore no one else who has ever knit it. It is one of those lengthy, wordy patterns. Eight pages in total. Lengthy and wordy versus clear and concise. My first issue is that the pattern does not state clearly where the start point is. As mentioned in an earlier post, when I first began the vest, I thought that I was starting at the arm pit and working up, down and out from that point. Having knit several inches on my first version, I can now tell you that I was right. Dear Designer, a simple statement to start the pattern would save knitters much head scratching. 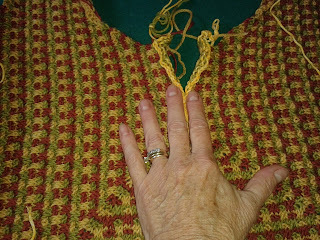 Next RS Row, Begin Armhole Shaping. Could I possibly be at the armhole already? How would I know for sure? Since I didn't know where I had started, I didn't know where I had ended up. 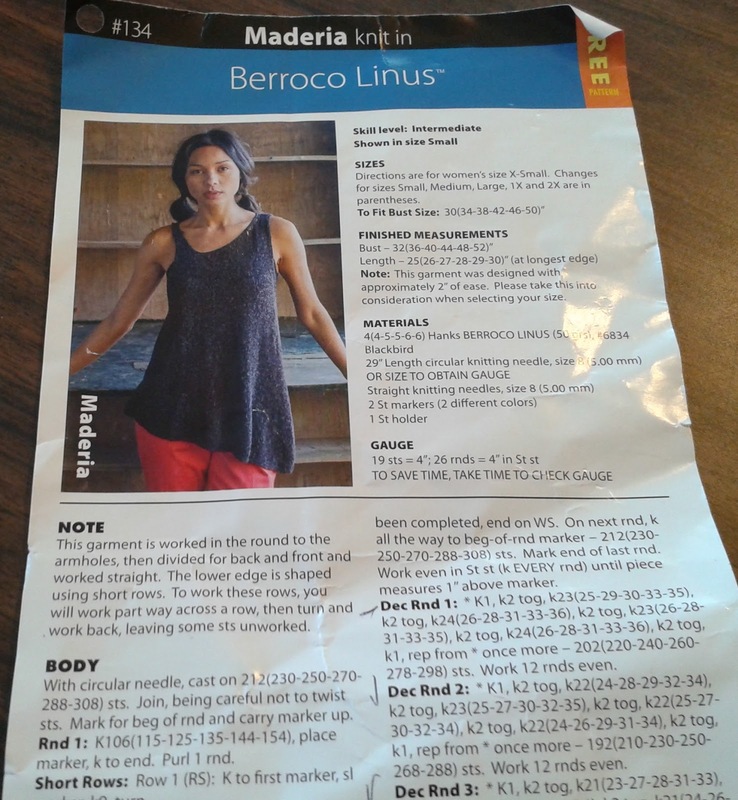 Dear Designer, Don't you want knitters to enjoy knitting your patterns? Then comes these instructions: Before you begin next row, using a 2nd skein of yarn (or remaining yarn end of 1st skein) knit cast on 38 sts with next colour in sequence for remaining armhole. (?? remaining?? Have I already knit one??) Cut yarn and place these live sts on a stitch holder. 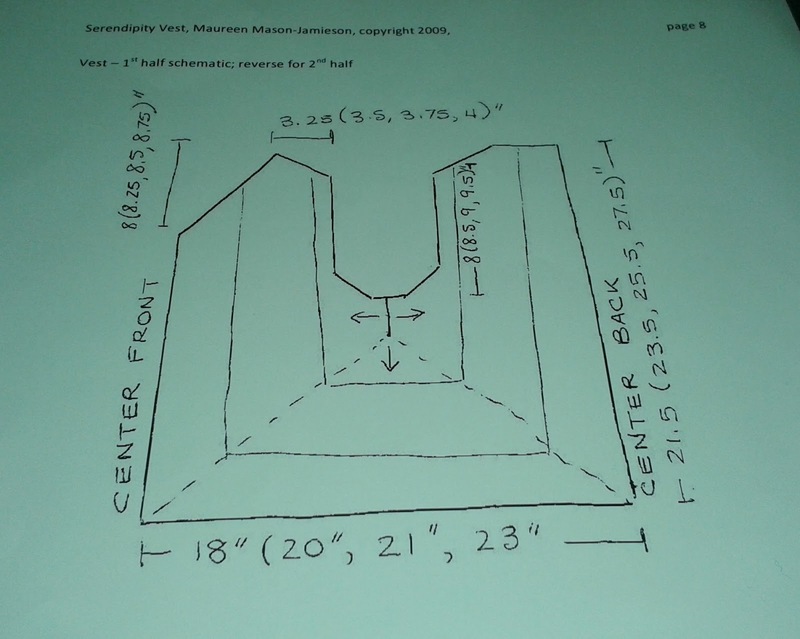 Next row, (RS) Using colour used for knit cast on, K38 armhole sts, k to 1st corner, (B1R, K corner st, B1L - this means to make one right and make one left ) K to 2nd corner, (B1R, K corner st, B1L) K remaining sts. Now, K across 38 sts from stitch holder. Nowhere did I get the impression that two sets of additional 38 stitches were to be created. Do you get that? I read about one additional set of 38. But at the end of these instructions the stitch count reads the same for stitches both before and after the corner stitches. So which part should I ignore? The instructions to knit one set of 38 stitches or the stitch count? I ignored the stitch count. Wrong decision. Dear Designer, Clarity please, clarity. 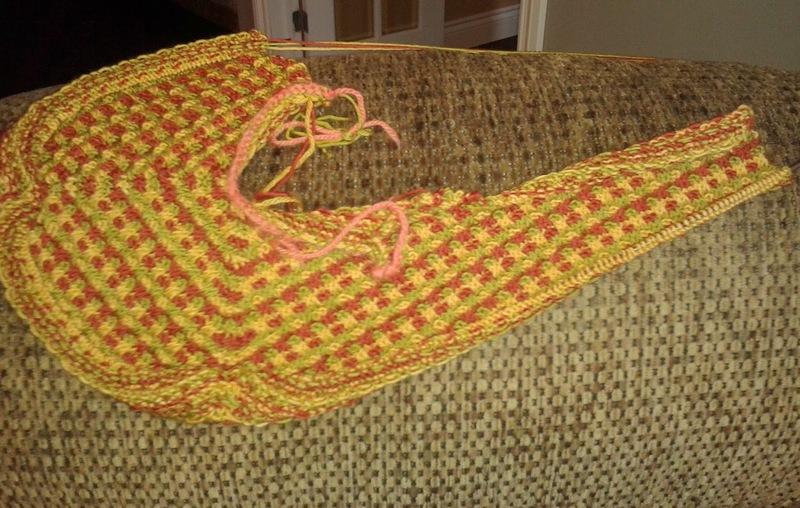 I kept knitting until the next major bit of info gave me another stitch count and said to start the 'V' neck shaping. The stitch count was supposed to be 101 at each end before the corner stitches. Well of course I had one side that was at 101 but the other side was short. Guess how much short? Right - 38 stitches. See the difference? According to the hand drawn schematic, mine didn't look right. Rip. At least a week's worth of knitting, gone. Dear Designer, Just becasue I'm retired, doesn't mean I have nothing to do. cast-on. At the very end of the pattern the designer says to remove the waste yarn and weave the two edges together. Ah Ha! So that is what I do with those live stitches and now I better see the shaping. Now wouldn't that have been nice to know at the beginning! Dear Designer - Tell the knitter where she is headed so she can enjoy the journey. After ripping I cast on for a vest of my own design. 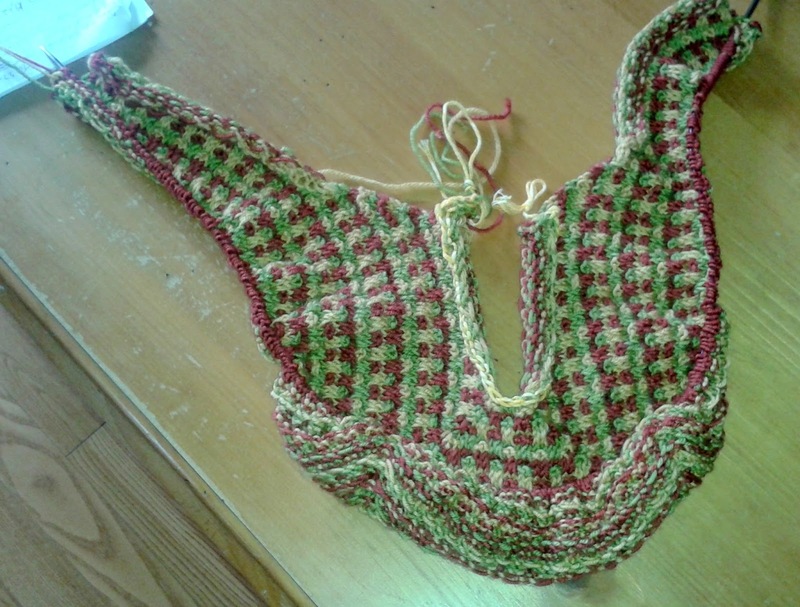 I would steal the slipped stitch pattern from Serendipity, work it from the bottom up, all in one piece. Dear Designer, I do NOT feel guilty about stealing your stitch pattern. But before I really got into my own version, I decided to take a stress break. Knit on something else for a night or two. And when I did that I began to think - well, why not try Serendipity your way, Brenda? Why not cast on those 38 stitches at both the beginning and the end of the row. 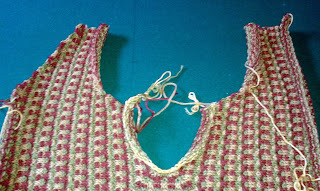 Afterall, if the vest has to climb the armhole in the front, it makes sense it has to climb it in the back as well. So - Take Two. If this version doesn't work out, the designer will get a real letter. PS - Spel Chick ist'n werking thus mmonring, so plese excuse my por tiping. 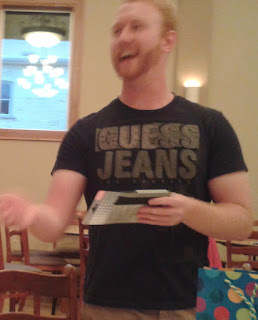 is headed to South Korea to teach for two years and his Mom, my sister, hosted a going away party for him. "I pay for one degree and one body part." If they needed/wanted laser treatment on their eyes, there would be no braces. Or vice versa. Likewise, after 4 years of university, any further education was the kids financial responsibility. My nephew graduated this spring from the University of Waterloo but would like to obtain his MBA. A two-year, costly programme. To finance this second degree, he decided to head off to South Korea to teach English. To live cheaply and save his money. The only potential hitch in his Mother's plan to teach him financial responsibility could be the threat that a good looking, 23 year old man might catch the eye of a lovely South Korean lady. Sis has threatened him about falling in love and putting down Korean roots. The party was lovely and it was a special surprise to meet a blog reader there. Meet Jane. My sister's long-ago babysitter and an avid blog reader. What a nice surprise. Thanks for reading, Jane. And if you are interested in the happenings of South Korea's newest English teacher, nephew has decided - at his Mother's insistence - to write a blog. Slowly, I am getting back into an 'at home' routine. Unusual for me, as my 'home-from-the-trailer' date normally doesn't occur until late August. The one good thing about my 'at-home-routine' is knit group. 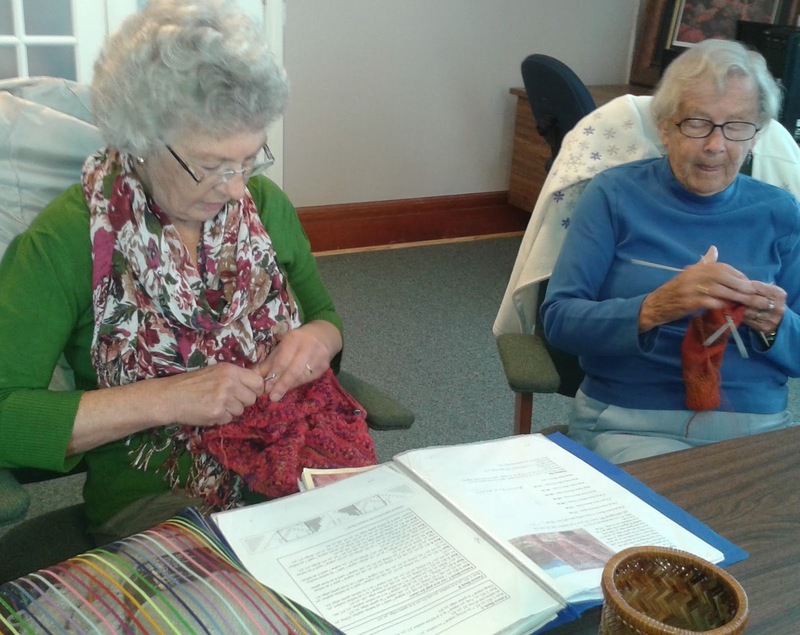 While many knitters are travelling still, the at-home knitters have lots on their needles. 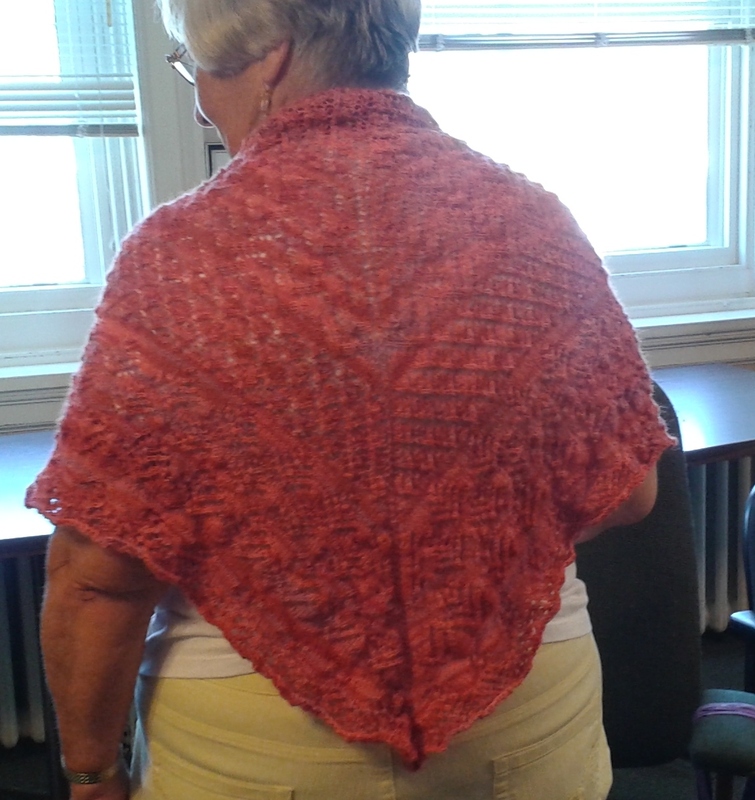 Carol showed me her beautiful new shawl. The colour is gorgeous, as is the lace work. Perfect for Florida, Carol says. Perfect anywhere, I'd say, Carol. 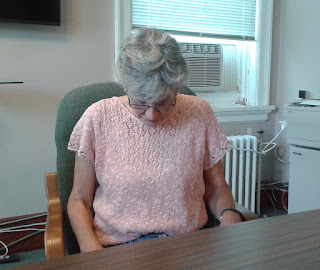 Jean, today, arrived wearing a great summer tee. Lace work in the 'vee' neck area of both front and back. 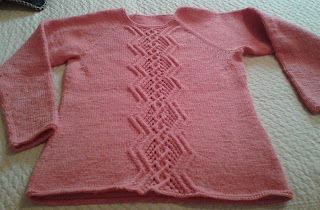 Knit so long ago, she remembers neither the pattern nor yarn name. Dang! But it is similar to this one by Tincanknits. 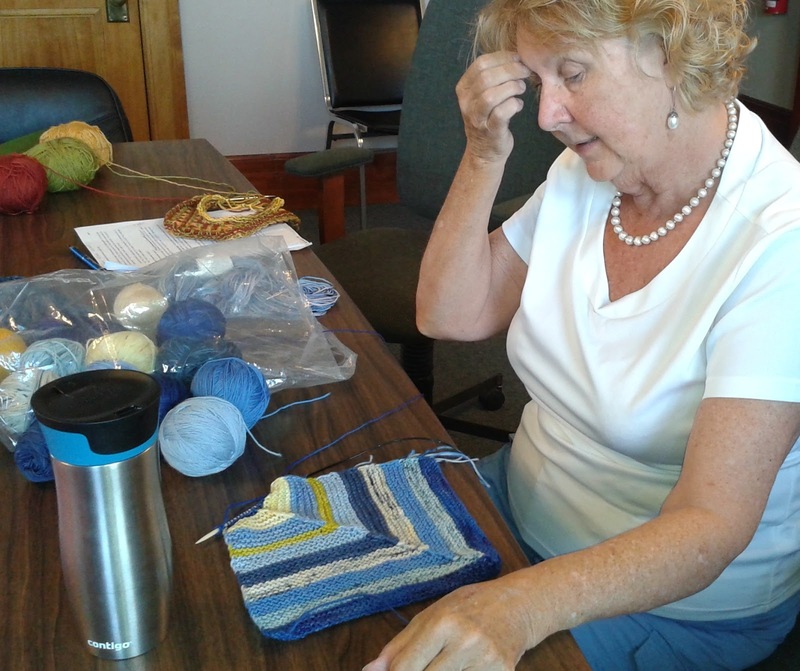 Carol, this week, is working on a lovely, asymmetrical 'tee'. Using the yarn called for, Berroco Linus, in a pale shade of duty rose, she is almost at the armhole. Finished soon, I imagine. 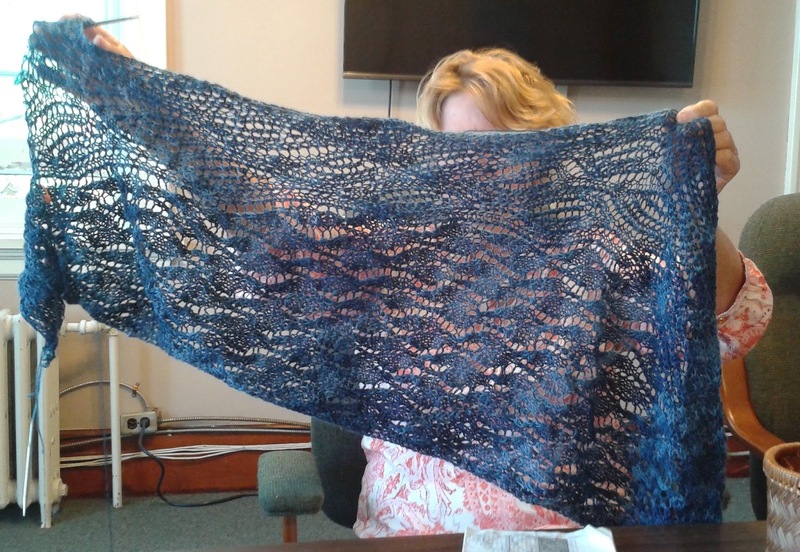 Sandy B, our shawl queen, has another beauty on her needles. I admire your tenacity, Sandy. Acres and acres of fine yarn and lace patterns are so not me. But Sandy loves that type of knitting. She certainly must have, by now, a shawl in every colour under the rainbow, if not for every day of the year. It might not be the trailer by the lake but knit group makes it great to be home. August means canning at my house. Top of the list today is the sweet pickles. Called 9 Day pickles in kitchens across the country for generations, yet recently named, in my kitchen, Scummy Pickles. So used to the scum and the stink have I become over the years that I didn't think to mention it to my neighbour when she took the recipe. As a result, every day for 9 days, in a state of shock and disbelief, she called to say " Brenda, these pickles are really scummy. Are they supposed to be that scummy?" 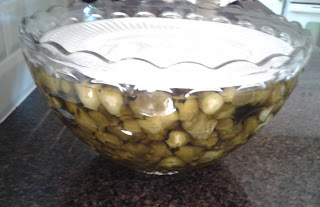 It was a puzzle to her, that first year, how anything that started so disgustingly scummy and stinky could possibly be the delicious pickles that she had tasted at my house. Since then she and I have re-named the 9 Day Pickles, Scummy Pickles. One more day of syrup solution to be poured over these and they will be ready for jars. Once the pickles have been attended to, I move on to my knitting. The Serendipity Vest is bigger than it was. Though I can only guess at where I am. I am hoping that the designer, like Elizabeth Zimmermann is a genius and has published a pattern that only makes sense upon completion. Hoping. 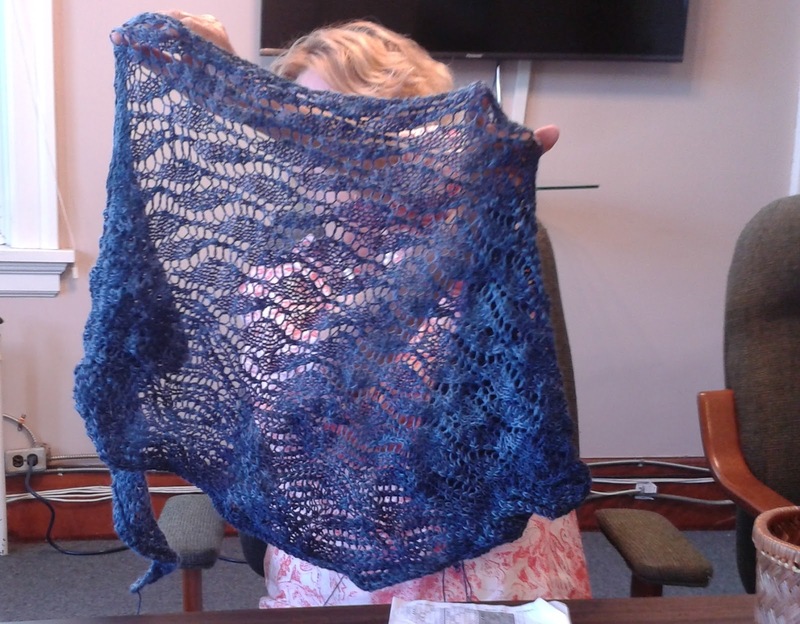 The summer of 2015 is supposed to see me knitting three, long-queued garments. My Valentine, probably the easiest, is finished. Always start with the easy and work your way up to the difficult - that's my motto. 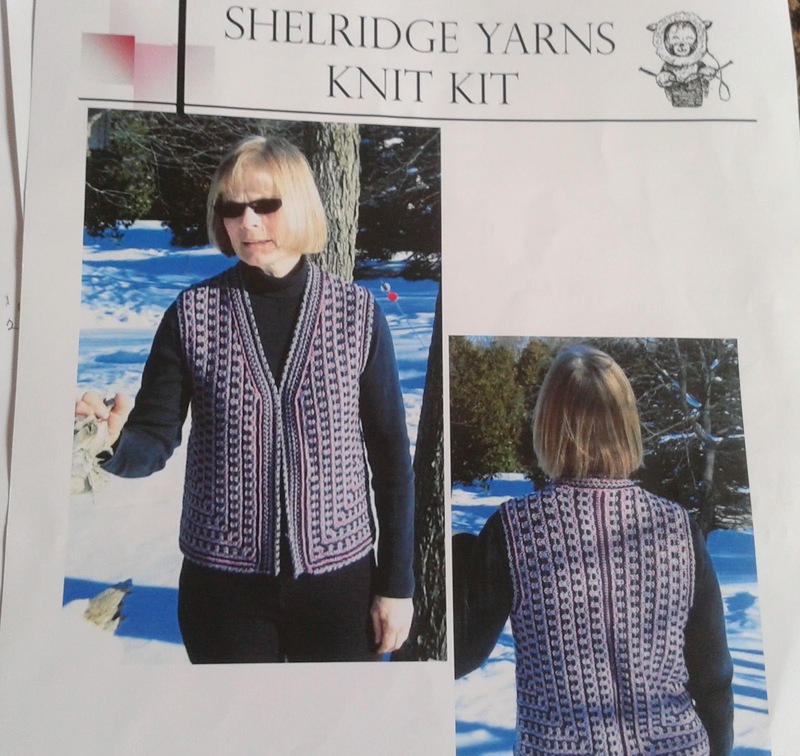 Second on the list is this vest, knit in a slipped-stitch pattern. I think it must have jumped my self-imposed, easiest-first queue because for being only in secon place, it sure has me discombobulated. 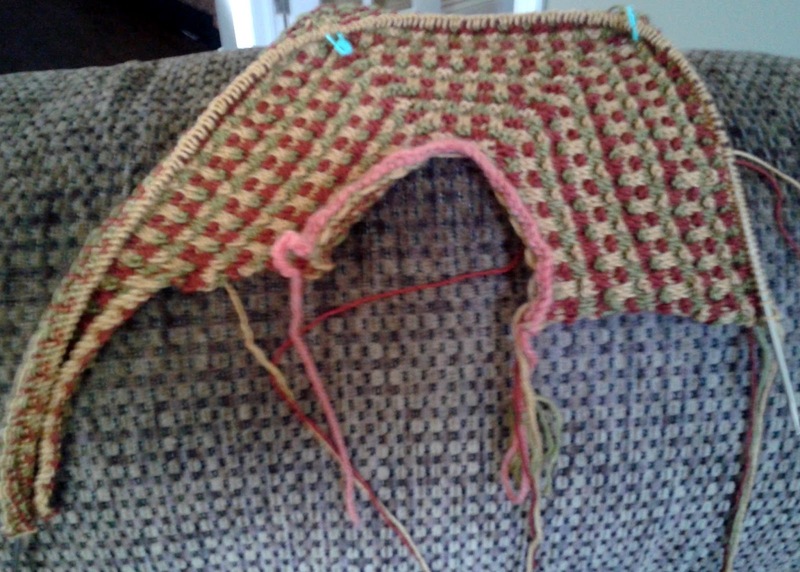 Despite the relatively simple, slipped-stitch pattern, the construction is confusing. What could be a very easy knit - if the designer had chosen to knit two fronts and a back - is complicated by knitting, mid back to mid front. 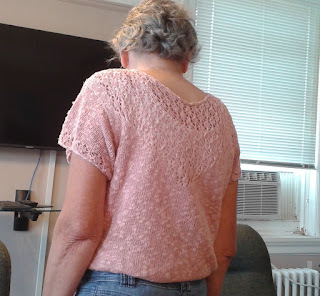 Add to that her decision to mitre the corners and somehow accomodate armholes and whew! I'm confused. Further complicating all of this is the pattern's lack of numbers. 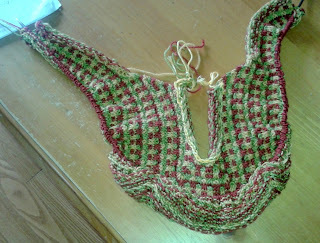 According to the rows already knit, I am ready to start the armhole shaping. But nowhere does it tell me how many inches of knitting I should have at this point. 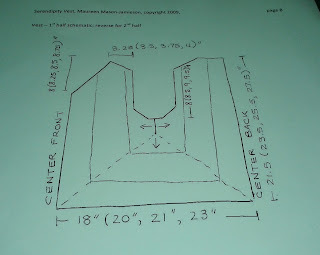 Is this how much vest I should have before starting the armholes? I have no idea. In fact I don't even know if I am knitting top down or bottom up or middle out. (The last one, I think.) Would it have hurt to tell the knitter this? At this point in my knitting, it's a guess. So--- guess I'll keep on knitting and see what happens. If I can't make it work out, I'll revert to a two fronts and a back version most designers would have used. Two sweaters and one vest were planned for my summer knitting. So far, one sweater is finished. 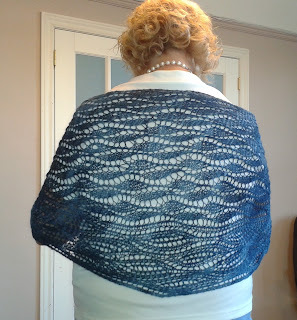 It is one long in my queue and I am pleased to have it in a wearable versus ball-of-wool state. 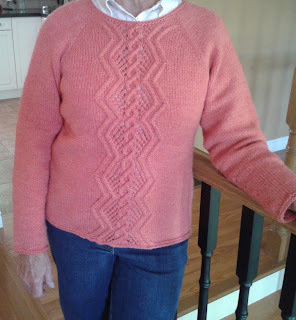 Pattern: My Valentine by Elizabeth McCarten. Yarn: Patons Classic Wool. 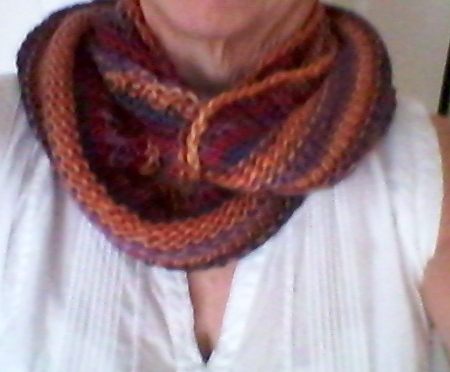 Purchased a couple of years ago at the Listowel Yarns tent sale held every summer in August. Specially for the sale, they package Patons Classic (normally sold in 100 g balls) in 400 g balls. The year I purchased mine, the 'big ball' was priced at $12. Equal to about one third the normal retail. I bought two big balls and used one and about a third of the second ball. Cost of the sweater? About $15. 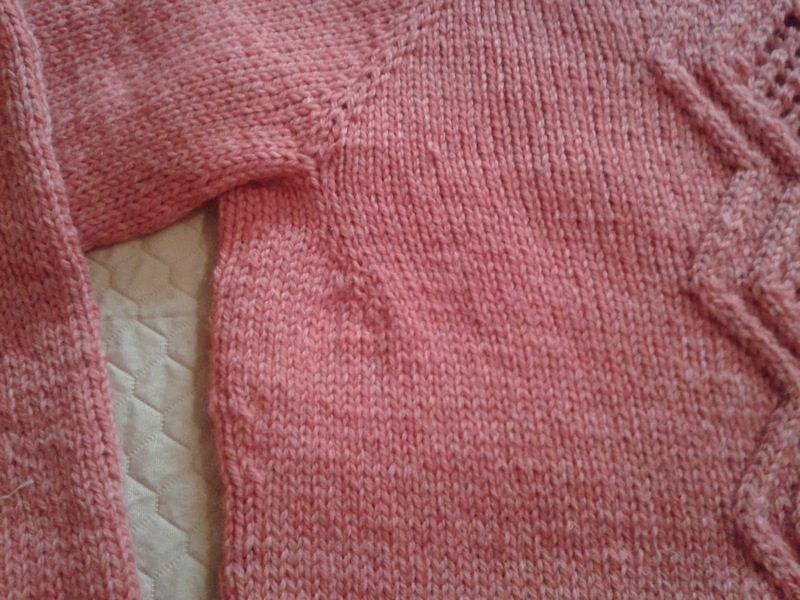 Needles: Although the pattern suggested - and I did start that way - a bigger than normal needle size to give the sweater 'drape', in the end I used a 4.5mm, a standard size for worsted weight yarn. Mods: Not many. The pattern is well written and easy to follow. I did choose not to put the cable pattern down the back. For some reason, while centre front cables seem decorative to me, a stripe of centre- back cable always seem like a target. I say not many mods, but truth is, I guess I am not really sure. 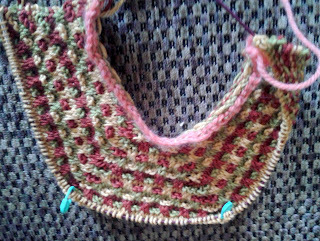 This is a top-down knit and as always with that type of construction, I use the pattern to get started with the suggested number of cast on stitches - and in this case the cable instructions - but after that, I knit to fit. I like a moderately snug underarm on my raglan sweaters. 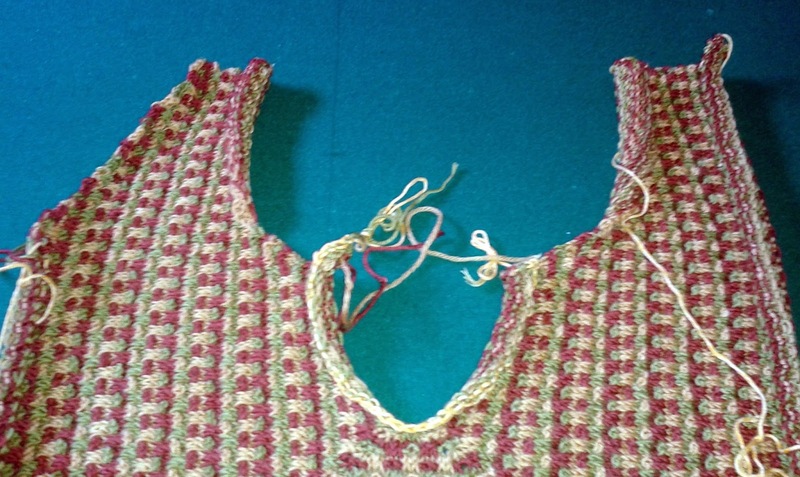 With top-down knits it is easy to keep trying it on until the underarm is exactly as desired. Remembering too, that it is meant for me - a woman - I stopped increasing a couple of inches shy of desired circumference, then divided sleeves from body. Once divided, I supplied the sweater with those two missing inches through bust darts. A simple line of increases that stretch from underarm towards the bust. 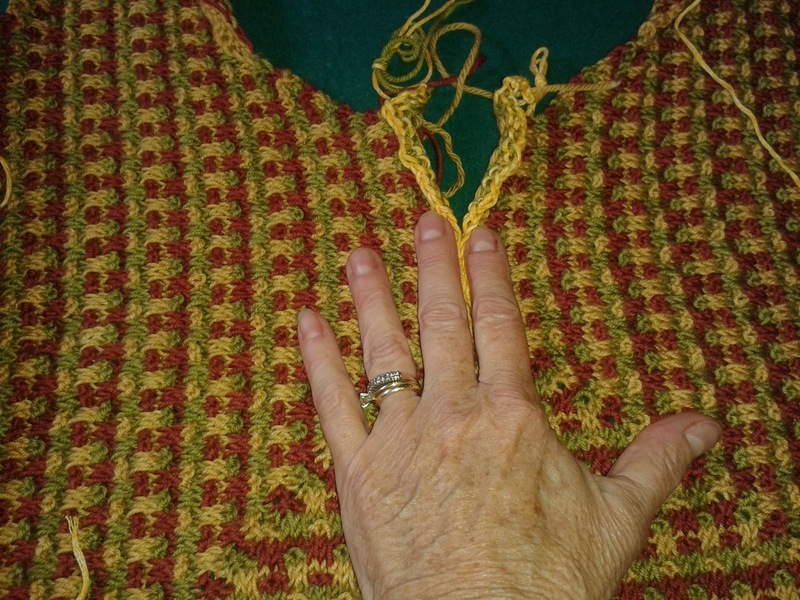 The trim, the same at neck, bottom and sleeve cuffs, is a row of purl, a row of knit and a cast off in purl. A neat and tidy, small trim. I did mine with the same 4.5 needle as used for the body. A great addition to my winter wardrobe. Last year you might remember that I knit nine H20 hats for my great Christmas give-away. This year I decided the give-away would be cowls. Back from the north, with a grand daughter in tow and limited knitting time, it was a perfect opportunity to start cowl number one. Knit with one ball of Riot by King Cole, a chunky weight, 70/30, acrylic/wool blend, with 134 metres, it is a design of my own making. 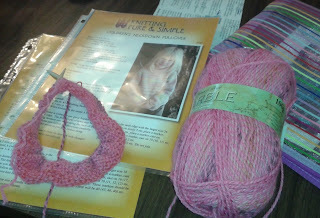 I cast on 125 stitches, working both the cast on then 3 rows of K1 P1 ribbing with a 8 mm circular needle. After the ribbing, I switched to a 6.5 mm needle and worked a sequence of 5 rows of knitting, 5 rows of purling like so: Knit 5 rows, Purl 5 rows, Knit 5 rows, Purl 5 rows, Knit 5 rows. 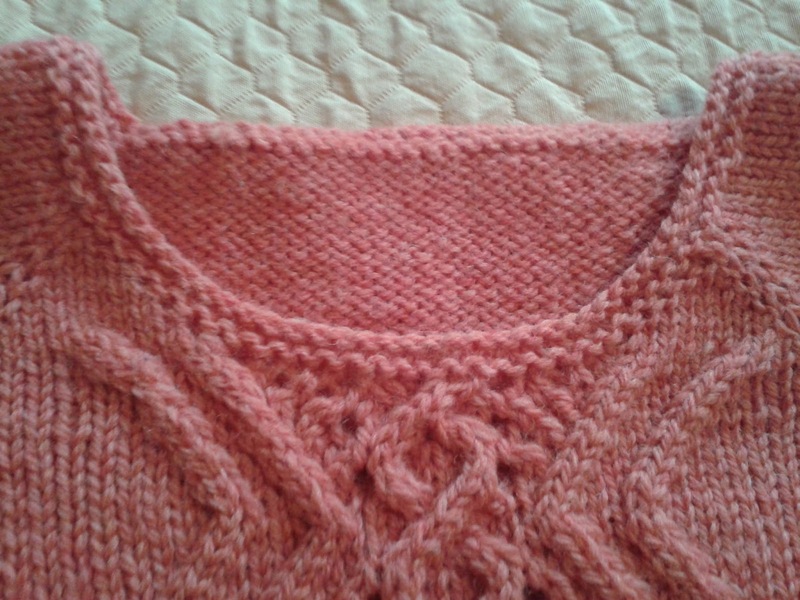 Following that, I reverted to the 8 mm needle and finished with three rows of K1 P1 ribbing before casting off. Earliest start to Christmas - Ever!